The proposal pleased Pharaoh and all his servants. Pharaoh said to his servants, “Can we find anyone else like this—one in whom is the spirit of God?” So Pharaoh said to Joseph, “Since God has shown you all this, there is no one so discerning and wise as you. You shall be over my house, and all my people shall order themselves as you command; only with regard to the throne will I be greater than you.” And Pharaoh said to Joseph, “See, I have set you over all the land of Egypt.” Removing his signet ring from his hand, Pharaoh put it on Joseph’s hand; he arrayed him in garments of fine linen, and put a gold chain around his neck. He had him ride in the chariot of his second-in-command; and they cried out in front of him, “Bow the knee!” Thus he set him over all the land of Egypt. Moreover Pharaoh said to Joseph, “I am Pharaoh, and without your consent no one shall lift up hand or foot in all the land of Egypt.” Pharaoh gave Joseph the name Zaphenath-paneah; and he gave him Asenath daughter of Potiphera, priest of On, as his wife. Thus Joseph gained authority over the land of Egypt. Joseph was thirty years old when he entered the service of Pharaoh king of Egypt. And Joseph went out from the presence of Pharaoh, and went through all the land of Egypt. During the seven plenteous years the earth produced abundantly. He gathered up all the food of the seven years when there was plenty in the land of Egypt, and stored up food in the cities; he stored up in every city the food from the fields around it. So Joseph stored up grain in such abundance—like the sand of the sea—that he stopped measuring it; it was beyond measure. The seven years of plenty that prevailed in the land of Egypt came to an end; and the seven years of famine began to come, just as Joseph had said. There was famine in every country, but throughout the land of Egypt there was bread. When all the land of Egypt was famished, the people cried to Pharaoh for bread. Pharaoh said to all the Egyptians, “Go to Joseph; what he says to you, do.” And since the famine had spread over all the land, Joseph opened all the storehouses, and sold to the Egyptians, for the famine was severe in the land of Egypt. Moreover, all the world came to Joseph in Egypt to buy grain, because the famine became severe throughout the world. But Jews came there from Antioch and Iconium and won over the crowds. Then they stoned Paul and dragged him out of the city, supposing that he was dead. But when the disciples surrounded him, he got up and went into the city. The next day he went on with Barnabas to Derbe. Cooking is an act of creation. Perhaps not creation ex nihilo as God created the world, but a kind of creation nonetheless. I continue to be fascinated by the millions of different recipes every culture seems to be able to make with the same small set of ingredients. Today we have televised contests over who can make the best tasting, most original of such recombination. One small detail has always raised my curiosity. Why is it that some recipes, such as many pastas, call for you to boil water and then put in the extra ingredients, while other foods, such as rice, require you to put them in the water first and bring it all to a boil? Some things cook fast and others cooks slow. 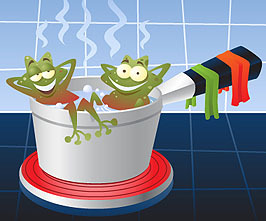 Cooking rice apparently is like the half-joke of cooking frogs – that you cook them slow so they don’t notice the heat until it is too late. I think people are like that too. We don’t like to change quickly and when we get thrown into hot water suddenly, we try to jump out as quickly as possible. If we can ease into that change though, we typically handle it much better. Take Joseph for instance. If he had been plucked up from his homeland and placed in charge of all of Egypt, he would have been well out of his comfort zone, probably still full of pride, and lacking the wisdom of trusting God to guide his work. The slow boil process of refining him, or sanctifying him, prepared him for the day he would save his family from their own sin. It works the other way too. Paul brought a quick boil kind of gospel to many of the cities he visited, gaining some immediate converts. However, some of the Jewish Pharisees from Jerusalem followed after him and began to draw people back into their former ways of life. The change Paul sought to make in their lives was confronted by enemies from both the Roman Empire, as well as the Jewish religious leaders. Some of the most faithful followers that Paul inspired ended up leaving their homes and traveling along to new homes as well. Indeed, most of the first generation of believers maintained their faith by traveling from place to place as refugees (or missionaries) which, in effect, may have been like jumping from one boiling pot to another until the gospel was finally, slowly cooked into them. God does not want to cook us, but he wants to transform us. John the Baptist promised of Jesus that he was not coming to baptize us with water, but with fire and the Holy Spirit. As we soak up the Spirit, heated by the flame of God’s love, we are transformed into something more than we could ever be on our own. What kind of boiling water has God led you into? How has that changed you?